David Charles Abell will participate in Porgy and Bess from 06/30/19 through 07/30/19 (Cincinnati Opera). For conductor David Charles Abell, classical music, opera, film music and musical theater all contribute to a diverse career, unified by a serious yet theatrical approach. The top international orchestras he has conducted include the London Symphony, BBC Symphony, Royal Philharmonic, Wiener Symphoniker, Orchestre Philharmonique de Radio France, Orchestre National de Lyon, Prague Philharmonia, Atlanta and Cincinnati Symphonies, Hong Kong Philharmonic, Iceland Symphony, West Australian Symphony, Philly Pops and Boston Pops. He has worked with artists as diverse as Sir Bryn Terfel, Diana Damrau and Dame Judi Dench, among many others. David’s television and radio appearances have encompassed a wide repertoire, from Johann Strauss with the period-instrument Wiener Akademie to the launch of the Ten Pieces classical music education project with the BBC Concert Orchestra. In addition to three televised appearances at the BBC Proms, he conducted the Les Misérables 10th and 25th Anniversary Concerts, both broadcast worldwide on TV. 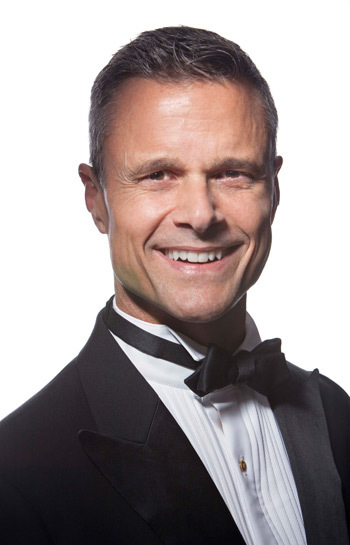 David maintains a thriving opera career, appearing regularly with Cincinnati Opera and Lyric Opera of Kansas City and guesting with several other companies. He recently made his Opera Philadelphia debut conducting the Barrie Kosky production of Die Zauberflöte. He has conducted Kevin Puts’ Pulitzer Prize-winning Silent Night to great acclaim at three US companies, as well as two European productions of Cole Porter’s Kiss Me, Kate in his own critical edition of the score. Following his successful English National Opera debut with Sweeney Todd in 2015, he returned with Carousel in 2017 to rave reviews. He recently made his Opernhaus Zürich debut conducting Sweeney Todd with Bryn Terfel and Angelika Kirchschlager. His ever-increasing catalogue of recordings includes Something’s Gotta Give with baritone Simon Keenlyside, excerpts from La bohème and Madama Butterfly with the Royal Philharmonic, Jonathan Dove’s community opera Tobias and the Angel on Chandos and complete recordings of the musicals Miss Saigon and Man of La Mancha. Forever, his 2013 EMI Classics recording with soprano Diana Damrau, was chosen as CD of the week by Norman Lebrecht. Future plans include his Volksoper Wien debut with Carousel, Porgy and Bess in Cincinnati and Atlanta, La bohème at Lyric Opera of Kansas City, and concerts with the Orchestre National Bordeaux Aquitaine and the Philly POPS (where he was recently appointed Principal Guest Conductor).